You may have noticed that London Pride has had a rebrand. There have been teasers of this since February but October saw a large scale operation to get the new branding on the bar and known to everyone. In early October you should have seen the new London Pride branding appearing in in our managed and tenanted pubs. On Wednesday 18 October, over 80 people from right across the business, set out to change London Pride pump clips in Fuller’s Free Trade accounts. With screwdrivers and brand new pump clips in hand, the fleet of people set out across the south of England to approximately 750 accounts to change pump clips. We’re promoting the new look London Pride with a fully liveried London taxi, which will be operating in the city until Christmas. I had the fortune of being picked to do my pump clip changeover day in the taxi. The lovely Fatima, the driver of the branded taxi, drove me to all of my allocated pubs in the Marylebone and Camden area to change their pump clips. It was a busy day, but a great opportunity to meet some of our Free Trade customers. I also discovered some hidden gems, which I’ll definitely be returning to. 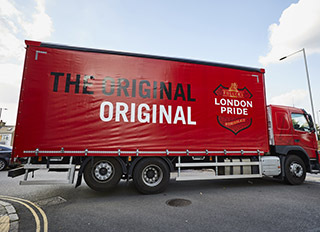 The new look London Pride is out in full force – keep your eye out for the new glassware, bottles, drays and much more.